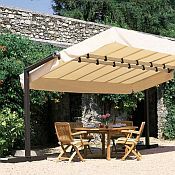 Beat the heat and keep your cool this summer with a unique California Series Freestanding Awning. These awnings are an excellent choice for shading large areas, and, unlike traditional awnings which must be attached to the house, Freestanding Awnings can be placed in any area of the yard. 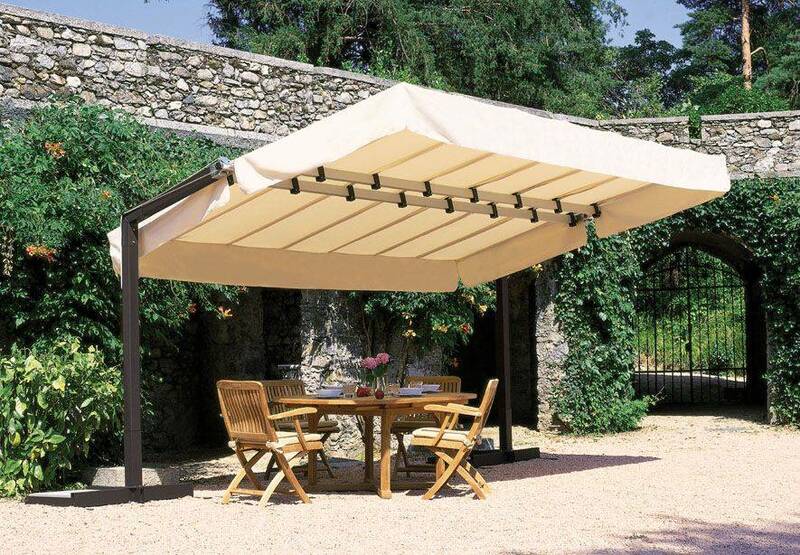 The Freestanding Awning provides what a patio or market umbrella cannot -- lots of shade! Freestanding Awnings provide more shade than most patio and market umbrellas, and these awnings tilt from front to back to provide increased coverage during the early mornings and late afternoons. You have your choice of various brilliant Sunbrella colors, and the canopy will retract with an easy to use patented drawstring. The California Series Freestanding Awning measures 10ftx15ft. The frame of the California Series Freestanding Awning is made of powder coated aluminum that will not rust. The California Series frames are available in White or Graphite. The crossbar supports are made of anodized aluminum, and all other hardware is stainless steel. These awnings are premium quality from FIM manufacturing and are built to last. The California Series Freestanding Awnings come standard with the Ground Insert Base/GIB unless specified otherwise. The Deck Mount Plate and the Freestanding Base are available at an additional cost. Please Note: the Freestanding Base FSB/T requires a minimum of six (6) 20" patio paver stones / 300lbs per side -- Paver stones are NOT included.